We can usually restore small cavities with fillings. However, when a large portion of your tooth has been damaged by decay, we’ll need to remove a significant amount of the tooth in order to remove all the decay. When a tooth loses much of its natural structure, it also loses much of its support and strength. As a result, it can easily fracture, or a portion of it can break away entirely. A cracked or broken tooth allows infection-causing bacteria into the vulnerable inner layer of your tooth, called the pulp. The pulp is comprised of soft tissue containing your tooth’s nerves and blood vessels, and an infection in this area can cause these tissues to die. Without its blood supply, your tooth can become brittle and break more easily. If this were to happen, we would need to perform root canal therapy to eliminate the infection within your tooth’s pulp. Without this treatment, the infection could easily spread to the root tips and into the surrounding bone, causing a damaging, painful abscess. A crown prevents these problems by completely covering the portion of your tooth that extends above the gum line. 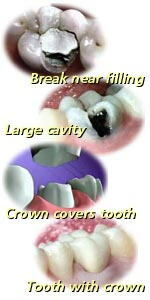 Crowns cover and protect your tooth, adding strength and stability and restoring your tooth’s function and appearance. Depending on where it will be placed in your mouth, your crown may be made from metal, porcelain bonded to a metal base, or entirely out of porcelain. Together, we’ll decide which kind of crown is best for your situation. It takes at least two appointments to create a crown, because it’s custom-made to precisely fit your tooth. First, we’ll prepare the tooth, and then we’ll take an impression. Using this impression, a model of your mouth is created; your crown is fabricated on this model. You’ll wear a temporary crown to cover and protect the prepared tooth while your custom crown is being fabricated.